This article was written by Sean Noble for The New Ledger. He blogs at Noble Thinking. 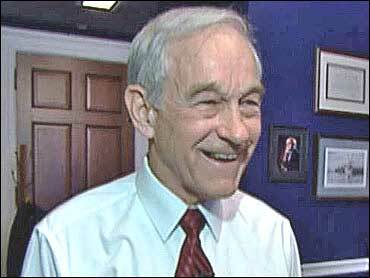 My argument that Ron Paul has outlived his usefulness enrages many a Paulite. What they don't know, is that I was a Paulite long before most of the current Paulite's had ever even heard of Ron Paul. You have to know a little about my past to understand this. I grew up in Show Low, Arizona, a small ranching and timber town in the White Mountains of eastern Arizona. There is a lot less ranching and almost no timbering now, it's mostly vacation homes and tourism. I was reared by very conservative parents. My first political memory is seeing tears in my mother's eyes in 1976 when Carter beat Ford and her saying, "We're going to be beaten by the Soviets now." Anti-communism was a staple in our household growing up. The two political magazines that showed up in the mailbox were The New American and National Review (I didn't learn until years later the massive battle between the John Birch Society and William F. Buckley). When the U.S. Olympic hockey team beat the Soviets, you would have thought I had won the lottery. I was a kid running around the living room with my fists pumping and you would have thought that we had just defeated Communism in one, fell swoop. I made phone calls for Reagan in 1980, passed out literature for him in 1984 and then reality hit me in 1988 when I realized that Reagan would no longer be the President. My parents were very skeptical about George H.W. Bush. His history as a Washington insider was a stark contrast with Ronald Reagan's populism. As the campaign between Dukakis and Bush went on, I felt more and more that Bush would NOT carryon the Reagan legacy. I turned 18 in the summer of 1988, and the first vote I cast in my life was for Ron Paul for President in November 1988. For you younger folk, Ron Paul was the Libertarian candidate for President in 1988. I had read up on him in The New American, and read a couple interviews with him. I didn't really know much about the Libertarian Party platform (I was registered Republican, as I always have been) but his comments about the role of government, monetary policy (yes, I was an early proponent of getting us back on the gold standard - and I still am), and tax policy were music to me. I glossed over the drug legalization stuff and proudly cast my vote for Ron Paul. I couldn't tell whether my mother was proud of me or not. She said Paul was more principled but that it was a "wasted vote." Was it? Probably. But it had an impact on me, because at the first opportunity I had to participate in this great republic (it's not a democracy) I cast a vote on principle. And I think it set the tone for every vote I have cast since - including my wasted vote for Ross Perot in 1992, and my wasted vote for the Libertarian Harry Browne in 1996. In fact, I was 30 years old before I cast a vote for a Republican for President. When I was a Congressional staffer I had a lot of fun chiding Ron Paul's Congressional staff for not being "true" Paulites. For the 14 years I work in Congress I am the only staffer that I know of that actually voted for Paul for President in 1988. But his time has passed. If there was anything that struck me coming out of CPAC 2010 this last weekend, it was a feeling that Ron Paul's fans need to focus less on a 74 year-old mediocre Congressman, and more on how to actually affect real change in the political process. Paul's victory in the CPAC 2010 presidential straw poll only serves to immediately diminish the impact that CPAC could have on providing conservatives with some direction on who some of our future national leaders might be. Ron Paul certainly won't be one of them. I'm not saying that to be critical, it's just a fact. More and more average Americans are getting involved in the political process through the Tea Party Patriots and other movements. They are real people, with real lives and most have never been involved in the political process beyond voting. The more they learn about Ron Paul, the less he will appeal to him. His dovish stance on the war on terror and his support for earmarking (the gateway drug to huge spending) won't wear well with newly inspired activists worried about federal spending and the debt. Either you are a fiscal conservative, or you're not. Unfortunately, Ron Paul is not at the most basic level. So, conservatives, tea partiers, libertarians… Americans, let's find those who stick to fiscal conservatism, limited government and less spending and then support them like the future depends on it, because it does.